Vroom, vroom -- start your engines! 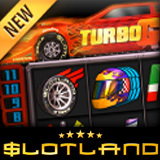 Slotland.com's new Turbo GT video slothas combines the thrills of auto racing with the excitement of online slots. The fast paced slots game has race track symbols like mag wheels, stop watches and trophies and a turbo-charged bonus game that gives up to ten free spins. Three “Turbo” scatter symbols anywhere on the reels trigger 10 Free Spins. Hitting Turbo scatter symbols during free spins adds even more free spins to the bonus game. Slotland now offers twenty-seven real money online slots also available as mobile slots. Friendly customer service has distinguished this popular online slots site since it opened nearly 14 years ago. I did try the Turbo GT Slots (mostly because I like to check out the competition) and observed that it was exciting and fun. I would reccomend the game and the service. I found both to be realistic and I won a quick $100 in about 20 minutes.